I photographed a few different species of dragonflies this summer. While looking through some photos I took near my parents’ cabin north of Montreal, I came upon this green eyed beauty and decided to attempt to identify it. 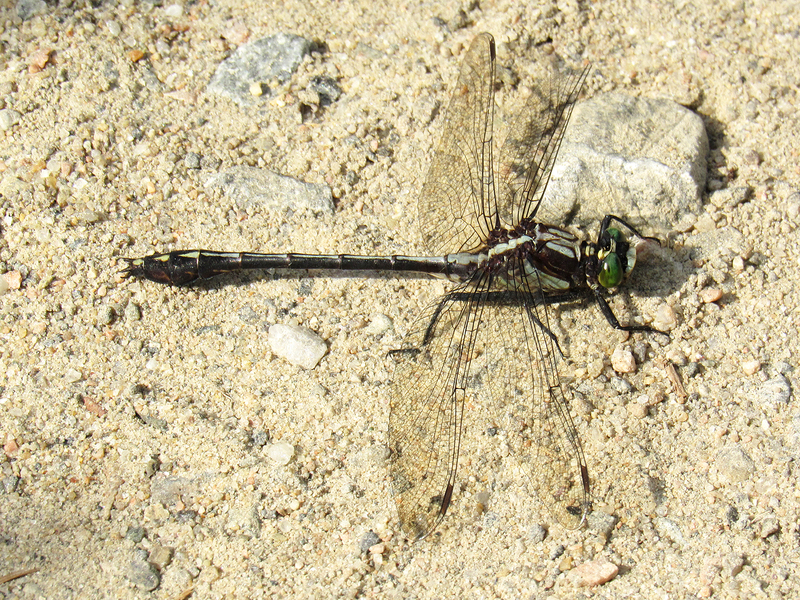 I think it is a male Midland Clubtail (Gomphus fraternus). Aw, thanks, Carol :-). I’ve been really busy with school work, but overall, things are going well-ish. It is fun to have a bit of time to edit some photos and check out my favourite blogs. Glad you are still finding time to paint and share your beautiful creations. Your devilled eggs look so tasty! Ohhh, we have those visiting around our house during the summer. We enjoy sitting on our porch watching them dart around above the lawn catching other buts/insects in the air that we can’t even see! Thanks for sharing its scientific identity. Very nice. I didn’t know about that site~pretty cool. I liked that I could select characteristics and get some possible matches. Do you have a collection of dragonfly photos? Which makes me think of butterflies… The University of Calgary has a collection of dead butterflies on display. Some of them are bigger than my hand. I should check were they found these specimens. Have you ever seen enormous butterflies? Oh yes. Giant Swallowtails are bigger than my hand~we had those in Peoria. Great Spangled Fritillaries are quite large as well. And we have very tiny butterflies as well. At Illinois Beach State Park I monitored over 40 species! It was a feast. They are so much fun to watch, and your photo allowed you to ID it – very cool. I bookmarked the page – thanks for sharing it. It’s often a challenge to identify different insects you find, but so satisfying when you can do it. Glad you enjoy watching dragonflies and I hope the page helps you ID a few :-). I like the added familiarity of being able to name an animal. Some insects are really hard for me to ID at the species level though, like bees and hoverflies and wasps.